We are parked in a paid aire in Coulon, France and Kelpie is plugged in getting his batteries recharged. (46.3206468, -0.5919825). Got up reasonably early (for us) and headed off towards Coulon which SatNav Sally assured us was only one hour away. The roads started as motorway and gradually reduced in size until we were “sharp righting” in some very small and old French villages. After yet another wrong direction from me and twice round the village square, we found the site. We managed to get a ticket from the automated entry machine and find a pitch. I have no idea what it looks like yet – it’s pitch black outside and not a light for miles. Hopefully we’re parked on an actual pitch and not in the wardens front garden. It is a very quiet picturesque setting with trees and lots of green space. There is a mixture of hard and grass standings – we chose a hard standing. Hard standing for the van and …… electric! We plugged in and got the heaters on – its still cold at night although the temperatures during the day are a lot milder than they are at home. Internet connection is sooooooo slow and no real phone signal so we watched Now You See Me 2 on the TV. We had a great nights sleep (so glad we brought the memory foam mattress). We discovered in the morning that there are about 80 pitches onsite. The sun is shining so we dandered off (Belfast slang for a slow ambling walk :-)) into town We managed as usual to find the longest possible route, though if we’d gone the quick way we wouldn’t have seen the beautiful Sevre river and got some amazing pics. 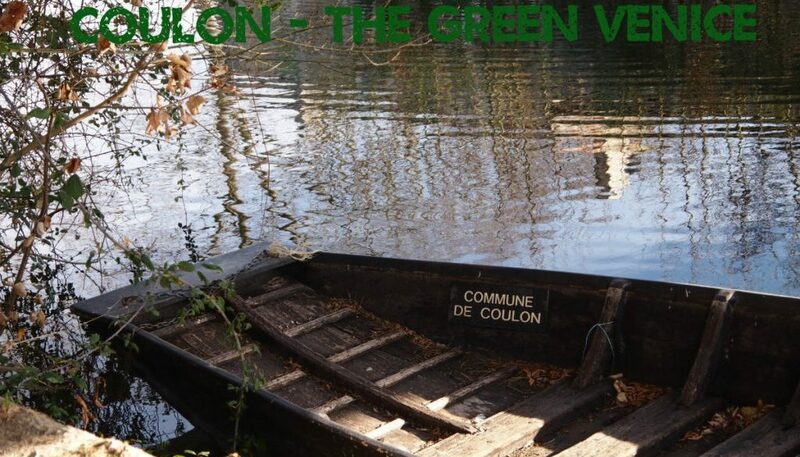 Coulon is known as the Green Venice because of the rivers and canals in this natural wetland area of France. The riverside is lined with quaint cafés, restaurants and a hotel (all closed for the winter) as well as fishermen’s cottages. In the summer, the little flat-bottomed boats are decked out with colourful seats ready for paying customers to take a gentle boat ride down the river. We found the town complete with the 8th Century church of St Trinity and a modern coffee shop. We even had the luxury of sitting outside with our coffee and a big sticky bun. We sat outside the coffee shop in complete silence save for the single toll of the church bell at 1pm. I think the French have vacated the country without telling anyone. French coffee and sticky buns! There wasn’t another solitary person in the town – it was beautiful. Every French town/village we’ve been to has been so quiet, it’s hard to believe anyone actually lives in them. To see Coulon come to life during in all its colourful glory in the summer, check out this blog post by Bonvanage. It certainly looks worth a later visit. Still trying to find a Post Office to post two increasingly tatty letters home. The Post Office in Coulon is only open from 9-12 each day (not good times for us). We spent the rest of the day working at the van and plotting our next move. Camped Out At Vendrennes Catching Up On Chores	Hemmed In By A Pony & Cart at Lignières Sonneville!